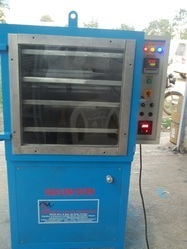 Prominent & Leading Manufacturer from Bengaluru, we offer vacuum oven. 4. The temperature range will be Ambient + 5 C to 300 C.
6. The unit will be fitted with minimum 4 No’s MS shelves. 8. Temperature uniformity will be +/- 2.5 C.
10. The Vacuum control will be digital electronic vacuum control through solenoid valves.1. The temperature controller will have an indication / setting accuracy of 0.5 C or better. 11. The oven will be supplied with BVT Make 250 LPM Direct driven rotary vane vacuum pump . 12. Vacuum measurement will be by BVT Make digital pirani gauge vacuum measuring gauge with sensor. 13. 1 No K-type flexible thermocouple sensor and it will be possible to measure and control heating of of the oven. The actual temperature will be made visible on the display. The system will be suited to Indian system of electrical inputs (220V/ 50Hz). Looking for Drying Ovens ?